The BSP Athlete of the Week presented by Southtowns Trophy is Starpoint High School’s Joe LoBrutto. A member of the Federation hockey team, the sophomore scored two goals in Monday’s 3-1 win over Williamsville East. One of the goals was a short-handed score, and Joe also added an assist. 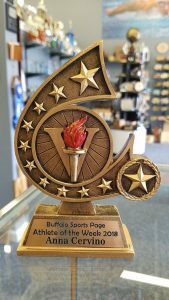 Joe receives a trophy from Southtowns Trophy in Orchard Park.